What’s the Deal with Dirty Socks? 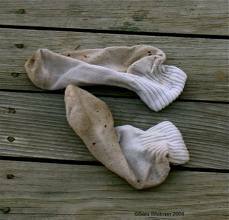 Ok all the Moms out there…what is the deal with dirty socks? Do your kids do this too? I find dirty socks everywhere! They frequently lay on my living room floor, on our back deck and in my kids’ bathroom, but the other day I found them on top of the kitchen counter—seriously??? How does that happen? Sometimes you and I get overwhelmed with all we need to do. The daily tasks before us make us feel covered up and it seems there is no getting caught up! If you are a wife or Mom, I want you to feel encouraged today about your role in the family. God has been reminding me that I need to have a heart of gratefulness in all things. When I begin to complain about all the things I need to do at home, He gently whispers into my spirit for me to turn my thoughts towards thankfulness for the responsibilities I have at home. God reminds me of the blessings they are in my life and to also remember they are kids….they are going to do things I do not want them to do. He also reminds me to have patience with them as Bryan and I seek to teach them how to be responsible adults. If you are tired today and there is too much work you need to do, instead of being frustrated, stop and thank God for the blessings in your life. Count your blessings one by one and imagine how sad you would be without those blessings in your life. Do not allow the enemy to steal your joy as a wife and Mom. Fill up with God’s Word and ask Him to pour out over you a spirit of thankfulness! A heart of gratefulness is just what you and I need. A Matter of the Heart! JOYTIME 2016 featuring music artist, Natalie Grant! Some “Extra” special people in my life! Oh, how I can relate! The best remedy to the frustration is as you say–to take the long view/big picture perspective. Thanks for the reminder!